It doesn't sound very radical does it? The wit of Interruptions has already been dampened by their removal from the broadcast context. They confront an engaged, expectant audience, not their passive target. Can we understand quite how difficult it must have been to infiltrate the mainstay of the British broadcasting industry, the BBC, when there is such a multitude of platforms available today? Should an institution that holds the contemporary at its core not be addressing the hidden power lines of the mass media that immerse us now? 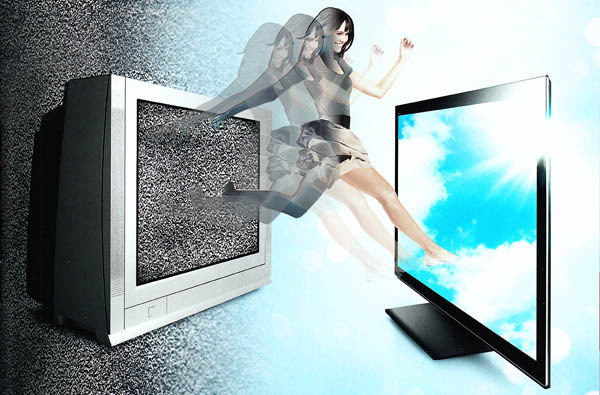 "Sooner or later, everything turns into television." Simon Denny proposes an answer. He has dropped a decommissioned analog television transmitter squarely in the centre of the space. 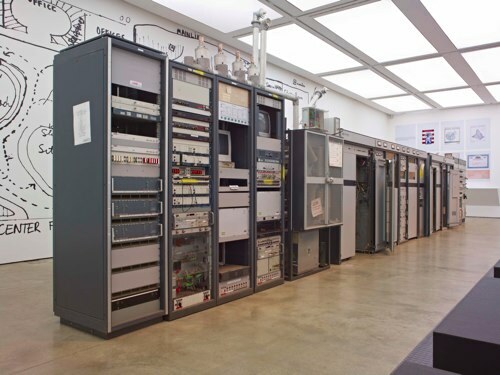 The fortified cabinets of circuits, oscillators and amplifiers all but fill the ICA's downstairs gallery; the solid mass of this engineered equipment heavy in its obsolescence. Just as Hall undermined the implied reality of moving pictures four decades earlier, Denny exposes the mechanics of the signal that has invisibly invaded the nation’s homes until now. Alongside Ira Schneider's (1971) Center for Decentralized Television, an enlarged pen and paper drawing that fills the back gallery wall, Denny's contribution shows visitors the machine behind the specter. His work suggests a direction. For there are gadgets and phantoms that form our current broadcast networks that could also do with an ousting. The ICA does not set about to track a new mutiny with its current show, but the implication is, at some point, it will. Upstairs, the awkwardness of television machinery is left below, and so too a little hostility. 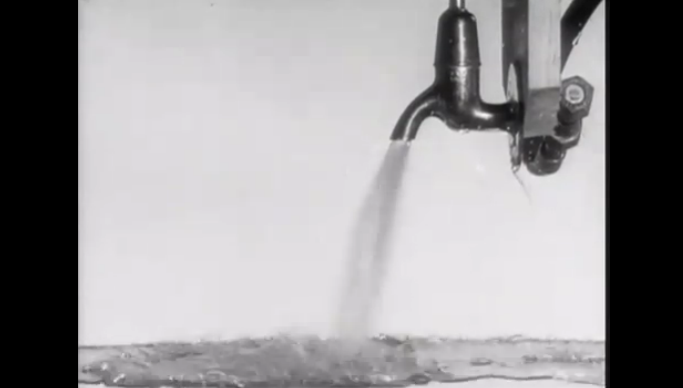 Mark Leckey's Felix Gets Broadcasted (2007) takes the image of the earliest test broadcast put out by a New York station in 1928. The silent-era cartoon character Felix the Cat, modeled in papier-mâché and spinning on a record turntable, had been television's first star. Leckey reframes the story, borrowing his title from an episode of the cartoon series where Felix is transmitted through telephone wire to Egypt. Leckey has consistently mined the history of television broadcast for the enigmatic and the peculiar. Taken from their context his plundered images celebrate the eccentricity of television, the first breather the exhibition's maligned medium of choice has had so far. Format too is given more space upstairs and works manifest as sculpture, video, screenprint and installation. Forty-two hand-held shots of the moon over a clock tower instantly scatter the viewer's gaze. Dividing the frames over two screens installed at a distance from each other, Hilary Lloyd's Moon (2010) exaggerates the minute, subconscious eye flickers of television watching into bodily movement. The artist gently hands back a scrap of self-awareness and so, control, to a screen-locked audience. 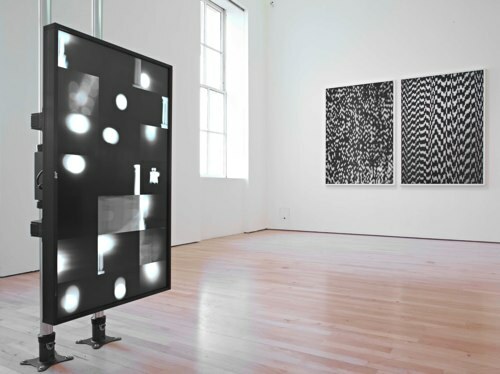 Installed adjacent to Moon, Tauba Auerbach's large-scale C-type prints of analog static capture a television screen as it attempts to make a picture of surrounding electronic noise. In observing a moment when analog becomes digital, just as the ICA marks this point in time, Auerbach elegantly reflects this transition and provides some concision on the exhibition itself. Her viewer, like the TV set, attempts to shift the random information into patterns, just as the audience of 'Remote Control' is left to make sense of our fragmented and uncomfortably recent broadcast history. The ICA shows television broadcast to be a fertile, but evasive point of artistic investigation. TV is dismantled, but the pieces not yet discarded. Joe Hamilton | Tue, Apr 17th, 2012 10:45 a.m.
ambon_pereira | Wed, Apr 18th, 2012 9:35 a.m.
just because television's gone flat-screen, digital and ubiquitous doesn't mean the beast has been discarded-- it's more like a hydra, yes? you cut-off the head, and it grows a dozen new ones; the essential thing having always been the transposition/dislocation of time, the image, and our "viewing". pynchon's novel vineland makes this dislocation into a metaphor for death-- he invents an entire ghost population, the thanatoids, who spend all of their time watching television, because this is how they parse their deadness. but i quite like this bit by denny, this sudbury transmitter. and i wholeheartedly agree with you, that: "--there are gadgets and phantoms that form our current broadcast networks that could also do with an ousting." not least of these: room 641A. perhaps an altogether more malevolent haunting. JohnieBlack | Tue, Apr 24th, 2012 4:54 a.m.
Mark Leckey has got it wrong (and many others no doubt), Felix was not 'the earliest test broadcast'. A ventriloquist's dummy, Stooky Bill, was the first recognisable image transmitted by John Logie Baird from his London Frith Street studio in October 1925, a whole four years ahead of the Americans and their experiments with a cartoon cat. Subsequently Bill modelled for Baird's scanner 'cameras' on many occasions, even in a cross-Atlantic broadcast. Why is it Baird just doesn't get the recognition he deserves even in the UK, though it can't be expected in the US - they invented and succeeded with everything first, right? But this artist Leckey (who won the overated Turner Prize) really should have done his homework.